The Denali Express Chevron Network supports Anchorage classrooms. ANCHORAGE, Alaska - Oct. 22, 2018 - PRLog -- The locally-owned and operated Denali Express Chevron Network is committed to supporting the communities it serves. Since 2013, the Network has given to classroom projects across the Anchorage School District through Chevron Fuel Your School, a program established by Chevron worldwide in 2010. To date, the Alaska program has raised over $600k for Anchorage classrooms. The Fuel Your School program is simple. 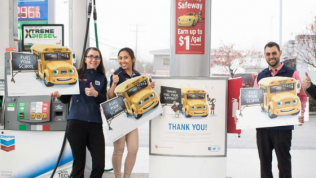 During the month of October, Chevron customers who purchase 8 gallons of gasoline or more at their local Chevron station can expect Chevron to donate $1 to classroom projects in the Anchorage School District, up to $100k. Alaska teachers can submit their projects through Donors Choose, a third-party funding platform. Since the Alaska program started in 2013, the Denali Express Chevron Network has helped fund over 700 classroom projects in over 100 schools in the Municipality of Anchorage. "Simply stated, we take every opportunity we can to connect with our local community," says Michelle Engelke, representing the Denali Express Chevron Network, "We are passionate about programs that involve both the community and our team. Chevron Fuel Your School is a great illustration of a program like this in action. By partnering with our community we have been able to make a substantial, positive impact in our educational system." Chevron encourages classroom projects in Science, Technology, Engineering, and Math (STEM) because the Corporation believes in fostering young talent in these fields for our future workforce. That said, Chevron Fuel Your School funding is available to all eligible projects that require $1,000 or less in materials cost. "By joint venturing with the community, we can focus attention and highlight various areas of need and work towards making a positive impact together," Engelke says, "We want to be a difference-maker and move the needle on the dial in a positive direction. Large-scale positive impact like this requires us to work in concert with our local community. It is exciting and we look forward to growing more programs like this as we move into the future." Denali Express is a network of Alaska owned and operated Chevron Stations that are deeply invested in their staff, industry, and the local, Alaska community. Customer service is a priority. Their stores are friendly, clean, and well-maintained. Denali Express offers Chevron with Techron gasoline and X-treme Diesel, which are both better for your car and for the environment. They sponsor many well-known local non-profits including Alaska Run for Women, Food Bank of Alaska, and NeighborWorks Alaska. Learn more at DenaliExpress.com (https://www.denaliexpress.com/)!